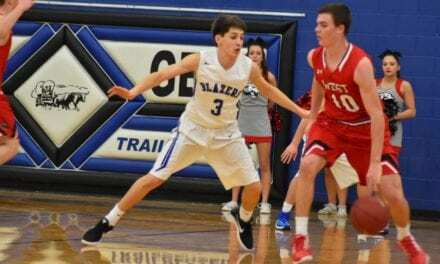 A furious second-half rally fell short, and the Gardner Edgerton High School Blazer junior varsity boys basketball team dropped a 71-53 decision at home against Blue Valley West High School on Jan. 9. Trailing by 13 points at halftime, GEHS trimmed the deficit to single digits in the fourth quarter. However, Blue Valley West responded and with clutch free-throw shooting down the stretch to take the victory. Despite the loss, GEHS got 10 points from Jordan McIntyre and seven apiece from Zach Bass, Mike Trivilino, John Bangert and Conner Boyt. Austin Hatton had five points, Eli Reynolds had four points. Bryson Rohr and Dylan Mars had two points.